Cribbage players of all ages, from the beginner to the tournament pro will enjoy and be challenged by this entertaining game. Size (inches): 12.40" X 2.28" X 10.83"
Excellent game. 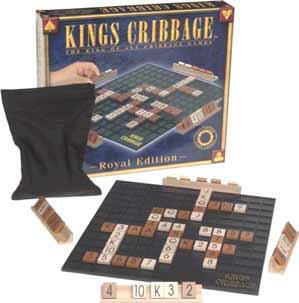 It is very similar to Scrabble but you still get to enjoy the Cribbage game rules. It is very easy to play as there are not too many rules to have to learn. 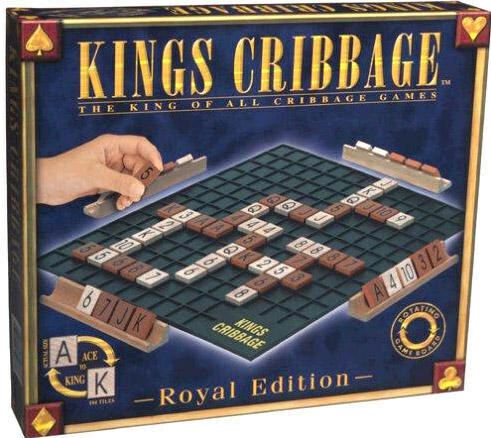 Kings Cribbage is a game that was very hard to find as we looked for it in the States and in Canada but luckily we found it on this website. Also Recommended: Double 12 Dominoes - but I still want to try the Double 15 Dominoes game. This is a Royal game that keeps the brain working--just enough but not too much to detract from the fun. And buying from Zooscape was the easiest and cheapest way. I don't remember how I found you folks but now I will remember where to go for my next game purchase. Thanks. I was very satisfied with this game, my husband and I enjoy playing regular cribbage, but this was even more fun.